Guiseley Community Foundation is partly funded by the National League Trust which provides some 65% of the cost of the projects we run. 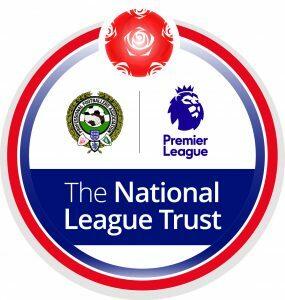 The National League Trust is, in turn, supported by the Premier League and the Professional Footballers Association without whose help we would be unable to function. The National League Trust (NLT) supports community programmes at clubs who are members of the three divisions of the National League. This support comes in the form of grant aid and development advice and their aim is to encourage every National League club to become involved in their community. Projects the NLT support range from music, dance and other arts activities, encouraging volunteering, work with young people not in education or training (NEETs), helping disability groups to play sport, and creating educational initiatives for both adult and children – including literacy and numeracy programmes. They have supported work with isolated community groups, green projects, information about healthy eating and lifestyle, and partnerships with schools to deliver football coaching and other activities. Their grant aid programme is made possible by the generous support of their funding partners: The Premier League and the Professional Football Association. Since October 2010 both bodies have committed annual support as part of a three-year funding agreement. From September 2016 this will be £1.2m each year for a further three years, bringing the total contribution to the NLT charity to £8.7m. The balance of the funding comes via support from individuals and local business. Charitable EndevoursIn the 2016 /17 season , with the help of local community partners, our own fans and visiting supporters we have helped raise more than £4,000 for good causes – a figure we are looking to better in the coming season. Charity six-a-side tournament in partnership with Guiseley Lions Beneficiaries include Medical Detection Dogs, Aireborough Children’s Centre Wesley’s Wish, CLIC Sargent. Blood Bikes and Inn Churches. Walk for Wesley match day initiative co-ordinated by Colin Robertson. Support for the Royal British Legion Poppy Appeal. Bucket collection and a raffle at the End-of-Season Dinner for the Sue Ryder Wheatfields Hospice in memory of club stalwart Michael Hill. Collection for US charity Camp Puzzle Peace, which supports young people with autism. Sponsorship agreement reached with Action for Children to have their logos on the front of our away shirts.